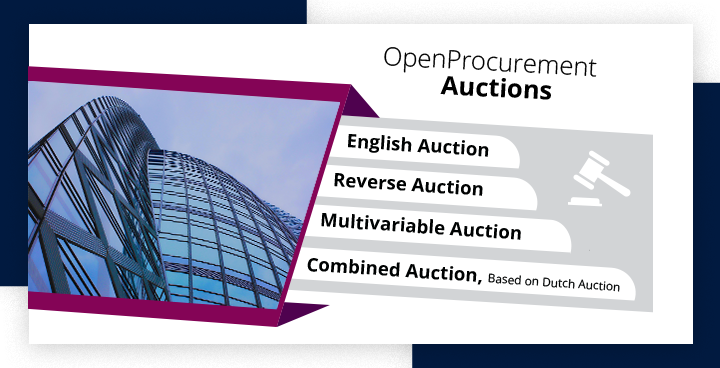 e-Auction module is one of the OpenProcurement toolkit components. It holds various types of auctions depending on e-procurement project. Insider auction, based on Dutch auction. An ascending dynamic auction: lots are sold to the bidder, whose bid is the highest one. Participants anonymously increment their bids at least by a minimal step value, particular for each auction. A winner is the participant with the highest bid. State-owned and state-funded organisations may gain considerable benefits. Participants lower their bids with each round. Suppliers compete to sell goods to the organizer (procuring entity) at the lowest price. Reduces the cost of product/service and allows buyer to compare prices, qualifications, and other factors at a glance. increased efficiency in the market. Consists of three stages and is implemented within Energy Services Contracts (ESCO) procedure. It is based on price plus other factors such as delivery times, service contracts, or negotiable bundles of products and services. A participant increases energy service contract performance indicators by no less than one minimal step of its previous value. The NPV formula encompasses the initial funds invested and the potential benefit. An ESCO that has registered a bid with the highest efficiency indicator, shall become auction winner. a modification of a Dutch auction and a price ascending auction. Dutch auction: starts before 10 and finishes after 16 o’clock, initial lot value is gradually decreasing by 1% until one of the participants agrees in this way to buy a lot for the indicated at that moment price or the Dutch auction stage finishes. Sealed bid: all participants that have joined the Dutch auction, except for the one that has made a bid at the first stage can make a sealed bid that shall exceed the bid made previously. Best price: lasts 5 minutes, all bids, made at the Sealed bid, shall be disclosed (while names remain unknown), and the winner of the first stage has an opportunity to increase their bid at the Best bid stage.